Weather: The wind has finally wound down a bit, temperature being 1-3°C was tolerable. There were even moments of sun. 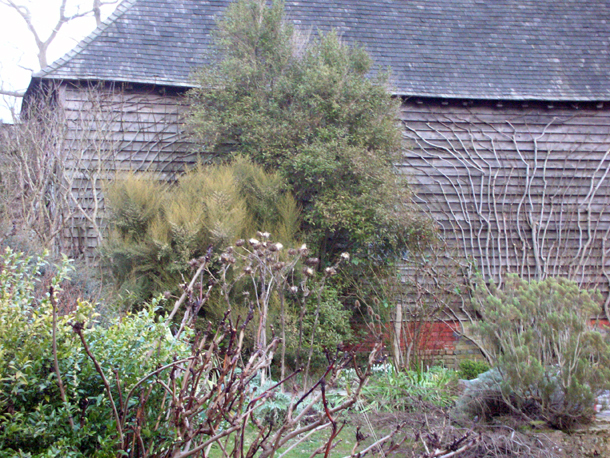 Layers of lines & textures almost creates a sense of movement in the garden. There are three groups of fig trees - Ficus carica 'Brunswick' in the Barn Garden that are trained flat against a tall barn wall in beautiful wavy lines, with one opening out into a big fan shape in the middle. I worked on the left hand corner pieces next to the mess room. Armed with tacks, tarred twine and hammer I set about retraining the structure, incorporating & pruning the new growth that has occurred over the year. It was like working on a sculpture. I pinned down any good new young vigorous shoots to replace older stems if necessary. 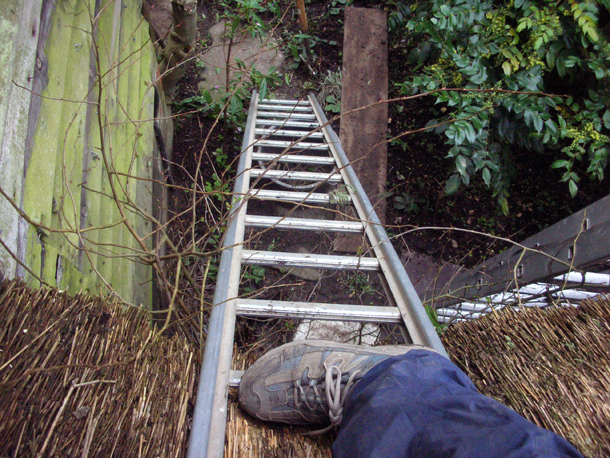 A lot of ladder work was involved, and I went up and down constantly to secure the stems in their new positions once I undid them to redo them again. Weather: Sunny, 3 - 4°C. What to train and how far you can bend a stem was informed by the fig itself, there was a certain limitation to how flexible or how far the stems would go. Each 'line' was reduced to one or two good growing stems and any excess especially ones that poked out too uprightly were cut off. Weather: Temperatures dropped to 0. One of the corners is adjacent to a low thatched shelter. For this I had to use double ladders. 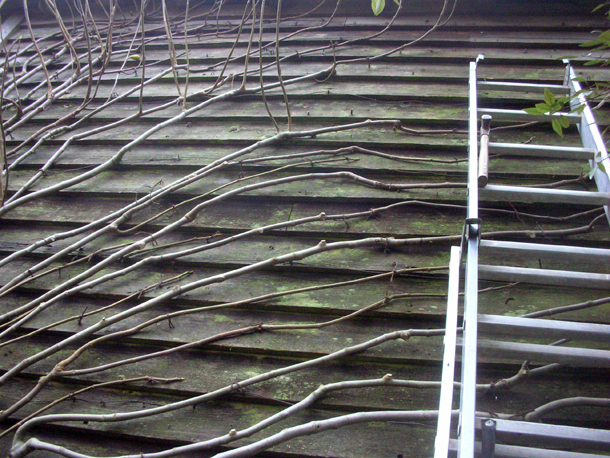 One to rest against the thatch itself, extra secured by a fork sunk deep into the ground at the base of the ladder, to stop it from sliding away, and one tall ladder against the wall that the fig was on. I climbed between the both like spiderman to complete the work. Heights can make me feel a little bit giddy and it was a challenge when I was all the way up at the top, especially when it was hard to get tacks into the old wood, but I managed to overcome this. I felt a deep sense of satisfaction when I had finished this epic task.